Beautiful vintage hand painted Bollywood poster of the mythological Hindi film Shri Mata Tere Roop Anek (1982) for sale. This is an actual surviving old movie poster of the 1982 Hindi mythology, which featured Srividya & Major Sunderan. Printed and circulated during the release of the film (somewhere in the early 1980s), this artistic hand painted old Indian mythology poster was originally designed for publicity of the film but never ended up being used. This poster was originally designed on a hand painted canvas by a leading Bollywood movie poster art studio, making it very collectable. This old Indian mythology poster has been painstakingly restored back to display condition using extensive taping at the back to repair numerous cracks and tears/rips. Since a few small pieces have gone missing near its borders, it has been graded as ★ As Is. 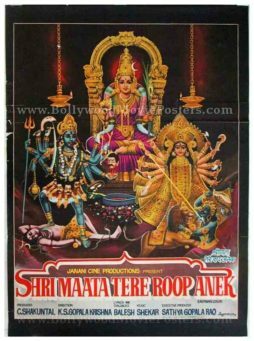 Shri Mata Tere Roop Anek is an old mythological Bollywood movie released in 1982.